What is Beer Day Britain? Find out more about Beer Day Britain. Beer Day Britain is an annual celebration on June 15th for all beer lovers and it celebrates all beer including traditional ales, mainstream lagers, and limited edition craft beer and everything in between no matter where it is brewed or who owns the brewing company. June 15th is significant because that is also the date Magna Carta was sealed in 1215. The great charter mentions ale in Article 35. Ale was so important in England in 1215 that it was cited in one of the most significant legal documents in history. Today beer and pubs are still central to British life and seven out of 10 drinks sold in a pub are beer. Britain has a dynamic brewing scene and an unmatched heritage in spreading the love and knowledge of beer around the world. More styles of beer first brewed in Britain are now brewed overseas than those of any other brewing nation. These include India Pale Ale, Pale Ale, Porter, Stout, Imperial Russian Stout, Mild, Bitter, Barley Wine, Brown Ale, and Scotch Ale. 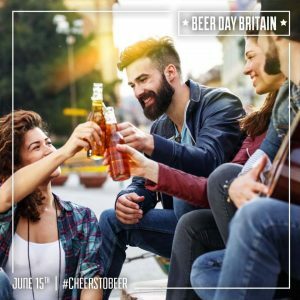 How Does Beer Day Britain Work? Beer Day Britain is a grass roots celebration. Brewers, pubs, beer retailers and beer drinkers make plans to celebrate the day in whatever way suits them best. If you are planning an event then please let us know via social media so we can publicise it. These are examples of activities that have happened in past years. Brewers have brewed celebration beers with British hops. Pubs have hosted special events including beer festivals, beer & food matching banquets, and fancy-dress parties. Beer retailers have sold Best of British Beer selection boxes. For information on how to get involved please download an information pack below. Ask your local pub, brewery, and beer retailer what they are planning for the Beer Day Britain celebrations and let’s have a national party! Beer is the most convivial of all drinks. It has a magical ability to bring people together and bond them. It soothes and makes us happy. It provides us with safe water and soluble nutrition. To paraphrase a quotation attributed to 16th century Swiss Physician Paracelus where he wrote about wine not beer ‘Cerevisia malorum. divina medicina.’ – A little bit of beer is divine medicine. So let’s celebrate this perfect libation on Beer Day Britain.